In the previous lesson, we deployed the contract to the Ropsten test network. 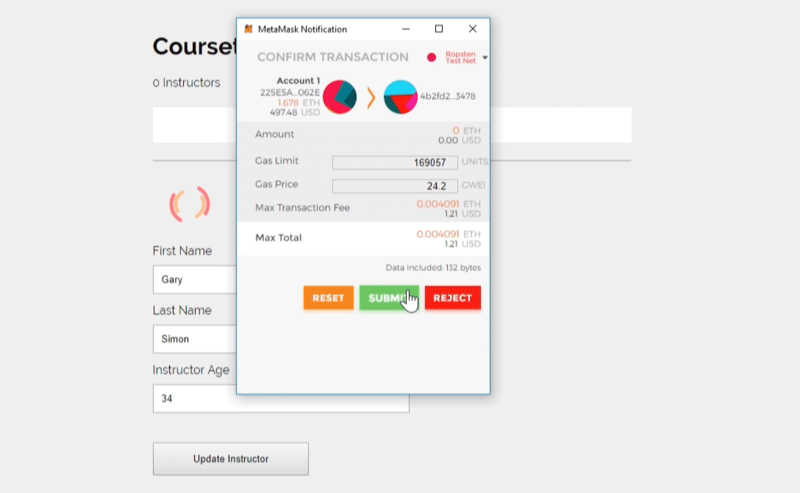 In this lesson, we're going to make adjustments to our Web3 UI project so that it works with the updated smart contract, and then experiment with using it. If you've been following along through this course, then you have access to the web project we've been creating for interacting with the smart contract through Web3. If you compare to the code to the previous form, you will find that the changes are minimal. There's simple a first and last name field now, along with a few extra spans with unique ID's. We're changing the name of the event, as that is the new event name that was changed in our smart contract, and we're also passing in an empty object for the first parameter, and 'latest' in the second. I found that adding these 2 parameters were necessary in order for it to work correctly on the Ropsten test network. 'latest' simply refers to the last block. In other words, only return successful for the lastest event block. There's just a few minor changes here. First, we're adding the if statement for result.blockHash so that it only removes the loader if the returned result is an updated blockHash. Next, we're using .toAscii to convert the bytes16 types that we changed from type string in the previous lesson. .toAscii will make the hex code readable. The only change here is within the arguments of .setInstructor. We're passing the transaction address, and adding the new fName and lName values. Now that the smart contract is deployined via MetaMask on the Ropsten Test Network, we can give our app a try in the browser. 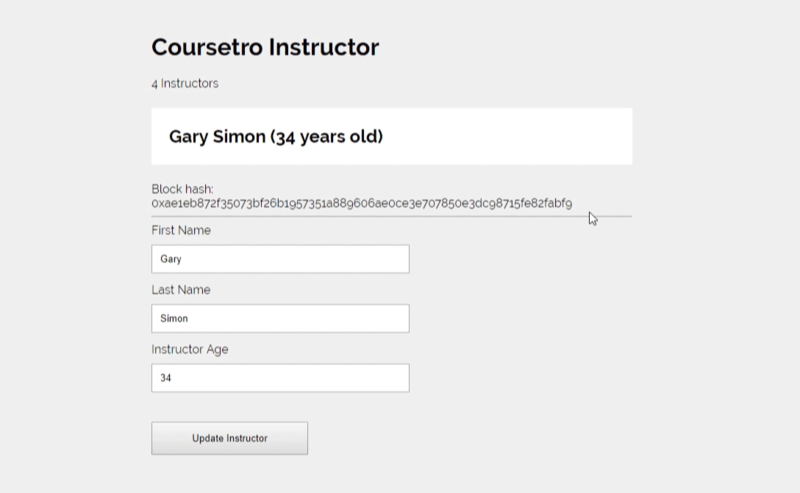 First, we set a first name, last name and an age and click Update Instructor. Once we hit Submit, the window disappears and our loading indicator starts waiting for a response from the event callback. Once the transaction has been confirmed, the loading indicator disappears and we're able to see the information based back from the event and displayed in the UI. You've just created your first decentralized app! 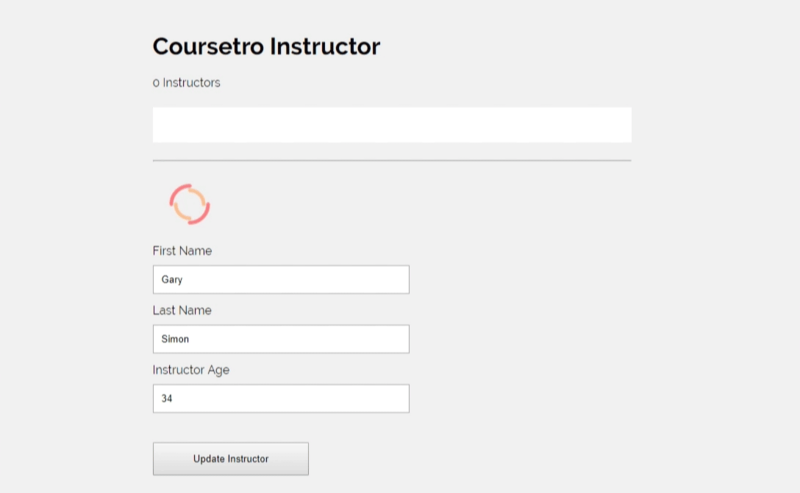 I would recommend extending this app further to display all of the instructor accounts, make them clickable, and display their information somewhere in the UI. All of the functions are there for you to use. Hopefully, you were able to learn a lot about Ethereum Smart Contract Development throughout this course. Stay tuned for more blockchain/decentralized app content in the future.